Each tablet contains: Alendronate (as Alendronate monosodium trihydrate 91.37 mg): 70 mg. Excipients: cellactose: 193.63 mg, croscarmellose sodium: 9 mg, colloidal silicon dioxide: 1.5 mg, magnesium stearate: 4.5 mg, opadry YS-1 white: 10 mg, Opaglos. Alendronate is a bisphosphonate that acts as a specific inhibitor of osteoclast-mediated bone resorption. Studies in animals indicate that Alendronate shows preferential localization on sites of bone resorption where it inhibits osteoclast activity, but does not interfere with osteoclast recruitment or attachment. Studies in animals show that normal bone mass was formed on top of Alendronate, thereby incorporating Alendronate in the bone matrix. Alendronate is not pharmacologically active when incorporated; therefore, it must be administered continuously to suppress osteoclasts on newly formed resorption surfaces. Studies in animals indicate that Alendronate treatment reduces bone turnover. In addition, bone formation exceeds bone resorption at these remodelling sites, leading to increased bone mass. The bone formed during Alendronate therapy is of normal quality. Absorption: Studies in humans showed that mean oral bioavailability in women was 0.64% for doses ranging from 5-70 mg when Alendronate was administered after an overnight fast and 2 hrs before a standardized breakfast. Oral bioavailability in men was similar to that in women when administer after an overnight fast and 2 hrs before breakfast. Bioavailability was negligible when Alendronate was administered with or up to 2 hrs after a standardized breakfast. Concomitant administration with coffee or orange juice reduced bioavailability by approximately 60%. Distribution: Alendronate is transiently distributed to soft tissue, but then rapidly redistributed to bone or excreted in the urine. In humans, the mean steady-state volume of distribution, (exclusive for bone) is at least 28 l. Protein binding: 78% in human plasma. Biotransformation: There is no evidence that Alendronate is metabolised in humans or animals. Excretion: Following a single IV dose of [14C] Alendronate, approximately 50% of the radioactivity was excreted in the urine within 72 hrs and little or no activity was recovered in the feces. The terminal half-life in humans is estimated to exceed 10 years, probably reflecting release of Alendronate from the skeleton. Patients with severe renal condition: No dosage adjustment is necessary for patients with mild to moderate renal insufficiency (Clcr 35-60 ml/min). Marvil 70 is not recommended for patients with severe renal insufficiency (Clcr < 35 ml/min). Hepatic insufficiency: As there is evidence that Alendronate is not metabolised or excreted in the bile, no studies were conducted in patients with hepatic insufficiency. Elderly patients: Appropriate studies performed to date have demonstrated no specific geriatric problems that could limit the benefits of Marvil 70 in the elderly. 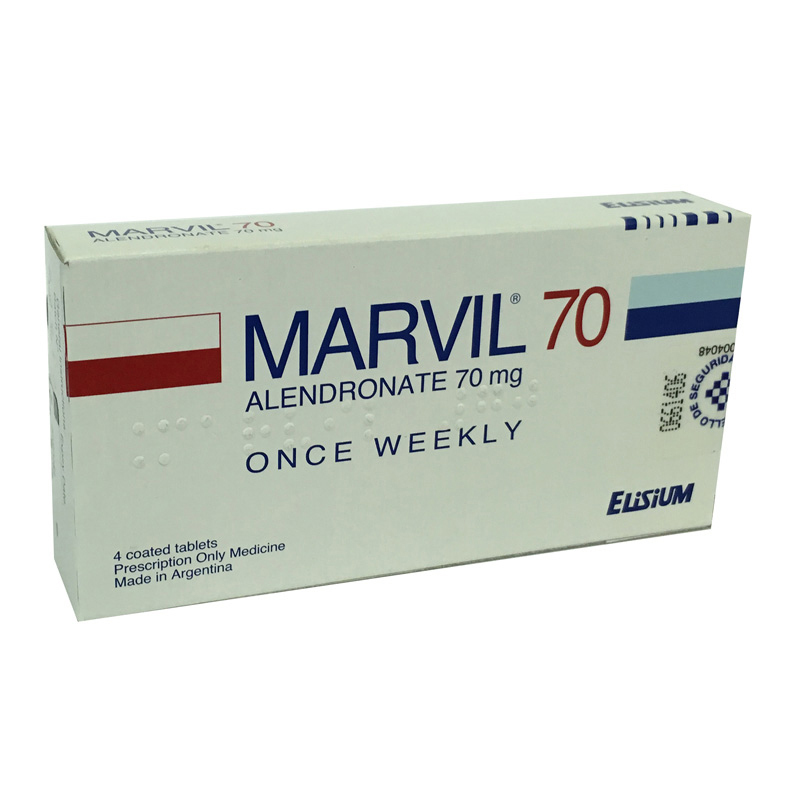 Marvil 70 is indicated for the treatment of osteoporosis in postmenopausal women and the treatment to increase bone mass in men with osteoporosis. Hypersensitivity to any component of this product. Abnormalities of the esophagus (stricture, achalasia). Inability to stand or sit upright for at least 30 minutes. Hypocalcemia. Marvil 70 may cause local irritation of the upper gastrointestinal mucosae. Physicians should be alert to any sign or symptoms signalling a possible esophageal reaction. Patients should be instructed to seek for medical attention if they develop dysphagia, odinophagia, retrosternal pain or new or worsening heartburn. The risk of severe esophageal irritation is greater in patients who lie down after taking Marvil 70 and/or those who fail to swallow it with a full glass of water. Marvil 70 should not be taken at bedtime or before getting out of bed in the morning. Hypocalcemia should be corrected before initiating therapy with Marvil 70. Vitamin D deficiency should also be effectively treated. In patients who cannot comply with dosing instructions due to mental disability, therapy with Marvil 70 should be used under appropriate supervision. Dietary supplements (including calcium), antacids and food and beverages may interfere with the absorption of Marvil 70. Therefore, patients must wait at least one-half an hour after taking Marvil 70 before taking any other medication. IV ranitidine was shown to double the bioavailability of Alendronate. The clinical significance of this increased bioavailability and if similar increases will occur in patients given oral H2 antagonist is unknown. Salicylates or salicylates containing compounds increase the incidence of upper gastrointestinal adverse events. Marvil 70 has been reported to cause a 2% reduction in serum calcium concentration and a 4-6% reduction in serum phosphate concentrations in the first month after initiation of therapy; no further decreases have been observed during the 3-year duration of therapy. Marvil 70 does not induce drowsiness. It does not interfere on the abilities to drive or use complex machines. Pregnancy: There are no studies in pregnant women. Marvil 70 should be used during pregnancy only if the potential benefit justifies the potential risk to the mother and the foetus. Lactation: It is not known whether alendronate is excreted in human milk. Because many drugs are excreted in human milk, caution should be exercised when Marvil 70 is administered to nursing women. Adverse reactions associated with Marvil 70 are usually mild, and generally do not require discontinuation of therapy. The adverse experiences considered by the investigators as possibly, probably, or definitely dryg related in ≤ 1% of patients (n:519) in either treatment are: abdominal pain (3.7), dyspepsia (2.7), acid regurgitation (1.9), nausea (1.9), abdominal distention (1), constipation (0.8), flatulence (1.6), gastritis (0.2), gastric ulcer (0), musculoskeletal pain (2.9), muscle cramp (0.2). Laboratory test findings: In double-blind, multicenter, controlled studies, asymptomatic, mild, and transient decreases in serum calcium and phosphate were observed in approximately 18% and 10% respectively, of patients taking Alendronate versus approximately 12% and 3% of those taking placebo. However, the incidences of decreases in serum calcium to < 8 mg/dl and serum phosphate to < 2 mg/dl were similar in both treatment groups. Gastrointestinal: Esophagitis, esophageal erosions, esophageal ulcers, rarely esophageal stricture or perforation, and oropharyngeal ulceration. Gastric or duodenal ulcers, some severe and with complications have also been reported. Skin: Rash (occasionally with photosensitivity). One 70 mg tablet once weekly. Marvil 70 must be taken with plain water only, at least 1 hr before the first food, beverage or medications of the day. Food and beverages such as mineral water, coffee, tea or juice will decrease the absorption of Marvil 70. Waiting longer than 30 minutes will improve the absorption of Marvil 70. To reduce the potential of esophageal irritation, Marvil 70 should be swallowed with a full glass of water (180-230 ml). Do not lie down for at least 30 minutes and until after the first food of the day. If dietary intake of calcium and vitamin D is not adequate, patients should receive supplemental. Severe renal condition: No dosage adjustment is necessary for patients with mild to moderate renal insufficiency (Clcr 35-60 ml/min). Marvil 70 is not recommended for patients with severe renal insufficiency (Clcr <35 ml/min). Hepatic insufficiency: As there is evidence that alendronate is not metabolised or excreted in the bile, no studies were conducted in patients with hepatic insufficiency. No dosage adjustment is necessary. Overdose experience is limited. The symptoms include hypocalcemia, hypophosphatemia and upper gastrointestinal reactions (upset stomach, heartburn, esophagitis, gastritis and ulcer). Do not induce vomiting due to the risk of esophageal irritations. The patients should remain fully upright. To bind Alendronate, antacid or milk should be given. Dialysis would not be beneficial. Store between 15-30°C in the original package, protected from light.